Toolkits offer guidance for the development of a national emission reduction strategy. The International Maritime Organization (IMO) has launched a new set of toolkits to assess and address emissions from ships and ports. Astrid Dispert, GloMEEP Technical Adviser, said the guides - available from the GloMEEP website - would help support countries seeking to develop and strengthen national policy and regulatory frameworks related to the prevention of air pollution and the reduction of greenhouse gas emissions from ships. 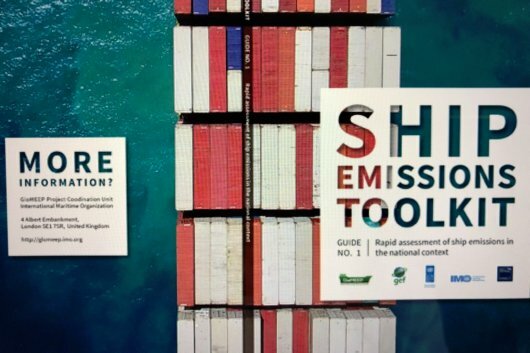 "Both the ship and port emission toolkits provide practical guidance on assessing emissions so that a national emission reduction strategy for the maritime sector can be developed. The GloMEEP guides provide a wealth of information on assessment techniques and how to develop a national strategy, as well as links to further practical guidance," Dispert said. Both toolkits have been developed through extensive testing and feedback from practical use of the toolkit guides during national and regional training activities held in the 10 lead pilot countries participating in the GloMEEP project. "We have been very pleased to work with the GloMEEP countries and both IMarEST and IAPH on these toolkits," Dispert remarked. "Ports and shipping are intrinsically linked - as such, efforts to reduce maritime emissions need to extend beyond seagoing ships alone. IMO's MARPOL Annex VI regulations on air pollution and energy efficiency are aimed at ships, but it is clear that for port emissions to be reduced, national authorities need to consider emissions from all sources, including cargo handling equipment, trucks - as well as domestic vessels. By utilising these guides, countries can develop national strategies which will address emissions from their maritime sector as a whole - protecting public health and the environment and contributing to the fight against climate change," Dispert commented. Such strategies would include incorporating IMO regulations into national legislation. Annex VI of IMO's International Convention for the Prevention of Pollution from ships (MARPOL) includes regulations to limit air pollution from ships as well as energy efficiency regulations to cut greenhouse gas emissions from ships. Guide 1: Rapid assessment of ship emissions in the national context: offers guidance for conducting a rapid assessment and generating both quantitative and qualitative information about a country's maritime emissions status at the time of analysis. Guide 2: Incorporation of MARPOL Annex VI into national law: provides useful information for policy makers and legislators in countries preparing for accession; as well as information for developing the legal framework to implement the regulations in MARPOL Annex VI in the domestic legislation. Guide 3: Development of a national ship emissions reduction strategy: supports countries in developing a national ship emissions reduction strategy that can guide potential policy and investment options. Guide 1: Assessment of port emissions: The guide is intended to serve as a resource guide for ports intending to develop or improve their air pollutant and/or GHG emissions assessments. It incorporates the latest emission inventory methods and approaches. It recognizes that ships do not operate independently from shore-based entities in the maritime transportation system, and that port emission considerations must extend beyond the ships themselves to include all port-related emission sources including: seagoing vessels, domestic vessels, cargo handling equipment, heavy-duty vehicles, locomotives, and electrical grid. Guide 2: Development of port emissions reduction strategies: The guide is intended to serve as a resource guide for ports intending to develop an emissions reduction strategy (ERS) for port-related emission sources. It describes the approaches and methods that can be used by ports to develop, evaluate, implement, and track voluntary emission control measures that go beyond regulatory requirements.